“Great speaker, very interesting subject matter and a brilliant book.” Peter Clayton tells you all you need to know." Informative, entertaining and useful. Highly recommended." and explains it even better. Everyone can read social body language. However, reading business body language can be difficult because of the need to be cautious or discrete. Using your instincts will give you an indication that you may not be getting all the facts or that something is not right. We have carried out more than twenty years' research working with major companies, a wide range of authorities, universities and training organisations. 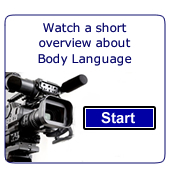 We have made important breakthroughs in reading and explaining how business body language works. We teach people how to convert their instincts into useful facts that can be used to improve their business skills. In business it's easy to justify why people should not reveal everything they are thinking. The trick is to spot when it's happening to us, what to do and how to change the balance. Understanding business body language will give you the advantage. Just as you may be wary of someone else, maybe your own body language can be revealing or causing concern to others. We have worked with many companies to improve their image resulting in a raised profile and conversion rate. What does it mean when someone's pupils constrict or dilate? Understanding what happens when someone is concealing something or showing interest can be very helpful. There are several zones to suit different situations. Get it wrong and you can convey the wrong message, get it right and you can build rapport . There are many signals that can greatly improve your success rate in meetings, sales, management, presentations, interviewing and negotiating. We can teach your team how to read those signals. In meetings it can make a great deal of difference if you can see who is the real decision maker, who are the influencers and how to change tactics to get the best results. Some gestures can be very revealing. Rubbing, touching and lightly scratching the neck, eye brows, base of the nose suggest that what you think and what you say is in conflict. People may become wary and lose trust. Something as simple as a handshake can create or damage the rapport process before a meeting even gets going. I have yet to meet anyone who has been taught to shake hands properly.